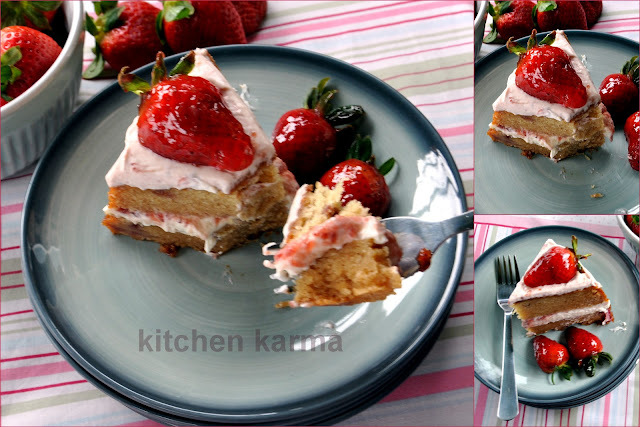 Kitchen Karma: Welcoming Spring With A Strawberry Cake! I baked. A heart shaped cake. 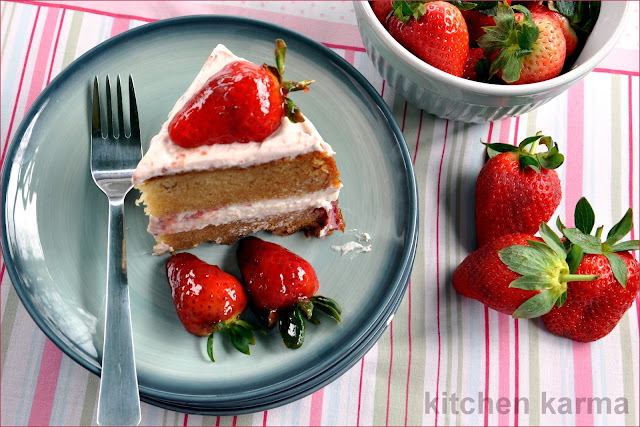 Layered with delectable pink strawberry filling and decorated with glazed strawberries. A perfect Valentine's Day cake. But baked in March, more to usher in spring. Not that the recent weather has given any indication of spring being anywhere near the British Isles! It has been grey, dull and rainy. But the tress have started coming back to life and I take heart. Any excuse to dig into a rich, moist cake is always welcome and if it is enjoyed with friends and family all the more better. After the excesses of the weekend, I still have a little leftover in the fridge. Lets say it will be the chief weapon to fight beginning of the work week blues. The recipe is my mother's standard sponge cake recipe. Growing up I have helped my mother make this cake innumerable times. Over the trials I have added my touches, here and there. Lets get started with the cake. Switch on your oven at 150 degree Celsius and in your mixer (if you have a cake mixer how I envy you!) start blending the oil and sugar for about 5 to 7 mins. You can see the colour and consistency changing. A little patience is needed at this stage, but believe me you, it is absolutely worth it. Then add the eggs one at the time, with the first egg add a table spoon of the flour. The flour stops the egg from curdling. Give it a blitz and move onto the next egg. Once all the eggs are added mix for 3 to 5 mins more. Add the vanilla extract and the buttermilk. Give it one more blitz. For now let the mixture be, once you stop the mixer, you will see air bubbles forming in the sugar mix. These bubble are the secret to a good, fluffy cake. In a mixing bowl, sieve in the flour, the baking powder and soda and a pinch of salt. Slowly add the liquid mixture and fold in gently, moving in one direction. Grease your cake tin, get your magic cake strips ready, if using any and pour the batter onto the pan. These cake strips stop the cake from doming in the middle and a flat top is a great help while spreading the icing. The cake takes usually 40 to 45 mins to bake. But each oven varies, so please keep checking. After 20 mins or so I place a big piece of foil over the cake tin. This stops the top from burning. Once your cake has passed the toothpick test, bring it out of the oven and leave it to cool completely. 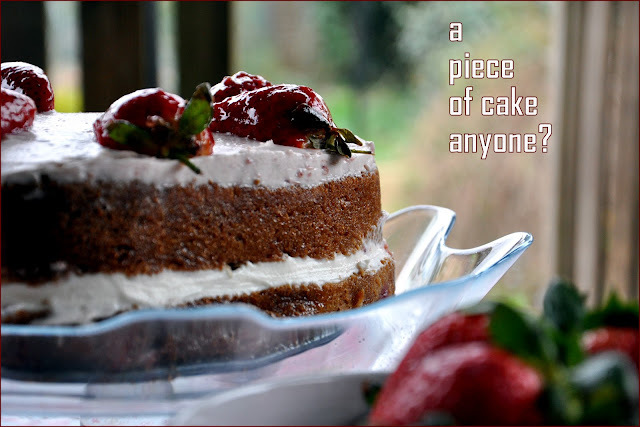 Ideally the cake should be left more than a couple of hours before attempting to cut it in layers. If you cut into a warm cake it crumbles and that we do not want under any circumstances. This video has a good tutorial on how to how to cut a cake into layers. Mix this really well, it will become light pink in colour and gooey in texture. Taste it, you will be tempted to taste another spoonful, but hold on. Once your cake has completely cooled down, cut it into two. Spread the filling, starting from the centre and leaving a little space on the edges, once you put the top layer back, the filling under pressure would automatically be pushed to the edge. Spread the remaining filling on the top by using a spatula. Wash 4/5 medium sized strawberries and pat dry. Cut them into halves, keeping the leaves on. Taste the strawberries, if they are really sour, you may need to add a little sugar to reduce their tartness. Take 2 table spoons of strawberry jam, add a little water, microwave for 20 secs or so. Mix it together and dip the strawberries skin side down in the jam mixture and let them dry. Your glazed strawberries are ready. The strawberry cake is ready to dig into. This is going to Rasi's I'm The Star Event. Strawberyy looks so colorful and yummy. Aweshadharon... ekta plan koro na kichu soumitro ke o bolo, we will take a week off and come down.... jeeb e jol.. This is amazing. It looks like something out of one of the best bakeries. Great presentation too! cake looks perfect..very beautifully presented..loved it!! Wow, awesome, got to try the frosting with mascarpone, there is always an excuse to eat something this good.. Thanks so much for inquiring, my dear:) I'm really sorry for having left you in the lurch about my whereabouts - but I actually had a very bad experience post the laptop virus issue:( The attack was so bad that I lost all my collection of blog photos that I would have blogged about in the coming days - the result being that I have to build back my collection again before I restart. Not just the blog part, but I lost a good number of important documents as well.Anyway, I am still a bit jittery about things but I hope to hop back soon - in the meantime carry on your great work and you'll find me there dropping by,now and then:) Take care! What a delicious and awesome looking cake. Wonderful pics. This cake looks delicious! I love strawberries plus it looks so moist. Thank you for sharing. I really do like the texture that oil gives to a cake, much lighter than the ones made with butter. 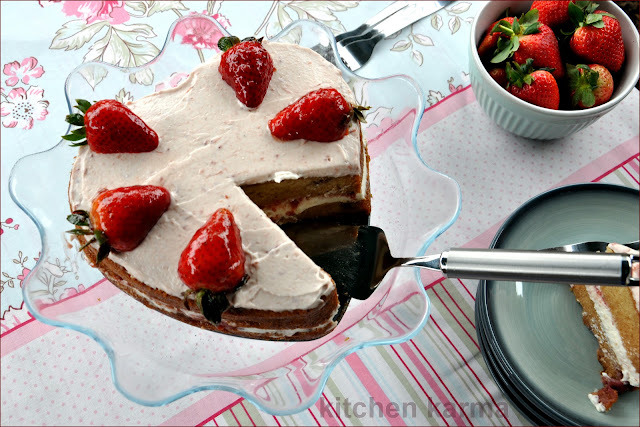 The cake part looks amazing by itself, but the addition of the strawberry marscapone icing makes it all the better. Stunning and delicious-I am sure it did not last long! That is one delicious cake. Strawberry cream....I can eat just like that!! Suchi, it is so beautiful! What a stunning cake, Suchi!!!! So moist and beautiful! OH my. This is absolutely breath taking. the glossy strawberries, the layers, the shape! I love it. delicious cake dear...looks wonderful :-)loved the clicks ! Perfect way to welcome spring ,lovely frosting!! Wow,,looks beautiful and Yummy,I love strawberry on everything!! That cake is a stunner. As I look at the five feet of snow outside, it doesn't seem much like spring, but I would eat this cake anytime! The heart shaped cake looks so beautiful. I am into everything heart shaped :-) Makes me fill up with love and cheer. Good to have crossed paths. This looks heavenly! I love the strawberry and mascarpone layers. Yum. 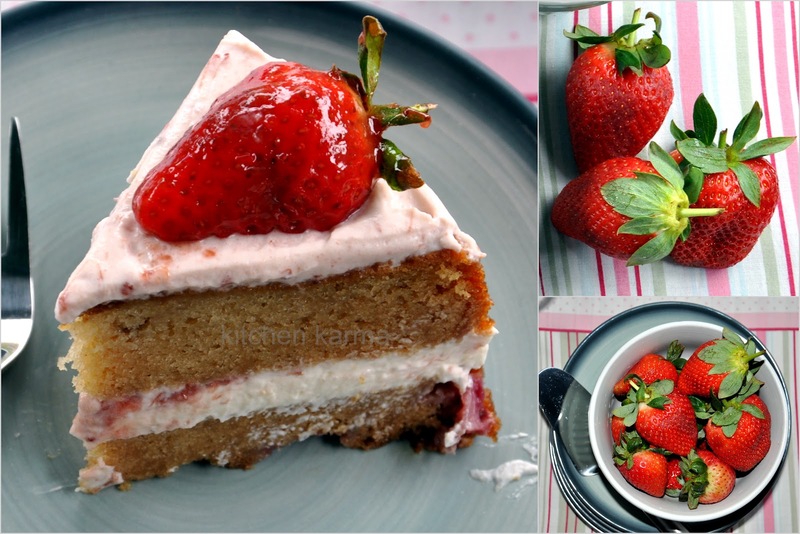 Your heat shape cake is more than awesome and those glazed strawberries....dear I am falling in love! Kal dol..... tomar aar tomar sob priyo joner jonno onek rong arr suvecha pathalam kolkata theke! Bosontor moto sundor hok tomader jibon! Uff !! gorgeous ... pls put it in a courier right away .. i am happy to send you my address and contact no .. Brilliant !! 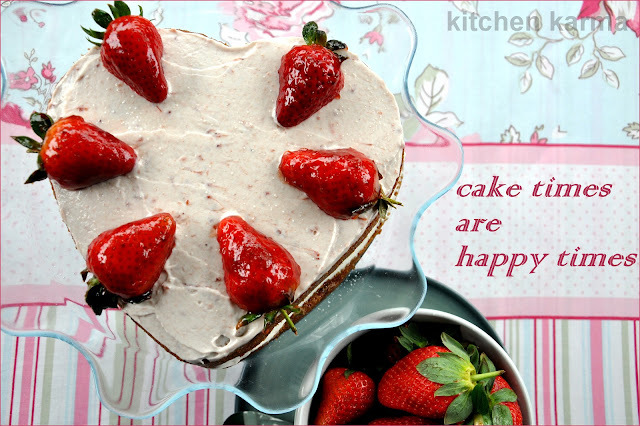 Liked ur cake..I have been thinking of baking a strawberry flavoured cake since a long time...Tell me about the weather, wonder when the spring will come in full glory.BTW from where did u get buy buttermilk ?? Is it available in supermarkets ?? I have never seen it the Tesco extra in my place. Gorgeous Cake Suchi!Love everything about it :)Droolworthy!!! Hi Suchi, I love your heart shape strawberry cake, so delectable. Beautiful and simple decoration with lovely presentation. Have a nice day. YES, YES! Cake please! Send me some? :) This looks SO good, and strawberries are a total fav. this is jus so awesome..